Call me provincial. I leave the Greater New York area only under duress. I never could get the hang of voluntarily paying top-dollar to sleep in a strange bed in a strange city, and then, upon returning home, facing piles of snail mail, and sometimes email and voicemail, too, if they were not accessible. I don’t need more stimulation or variety; I have stacks of unread books on my night table, lists of movies to watch, friends to see, family to visit. On those rare occasions when I may become afflicted with an urge for adventure, 15 minutes of perusing travel magazines cures me. So, why am I writing this while sitting at a makeshift desk in a thatched roof bungalow on an unpaved street in Pohnpei, Micronesia? Trust me, this was not my idea. My husband is often asked to address university administrators and their meetings are usually in Boston, Orlando, and other convention-appropriate cities. When David announced, nearly a decade ago, that “college business officers from schools in the western Pacific are having a meeting in Micronesia and they’ve asked me to be the keynote speaker,” I was sure he was kidding. I was wrong. He considered this a once-in-a-lifetime opportunity. I grabbed our atlas and learned that Pohnpei is the capital of the Federated States of Micronesia (FSM), and it is exactly on the other side of the Earth from us. It is midway between Honolulu and Manila, 2,000 miles southeast of Japan and 2,400 miles north of Australia. The FSM are hundreds of small islands, and four main state islands—Kosrae, Pohnpei, Yap and Chuuk—which stretch across the Western Pacific for 1,800 miles. 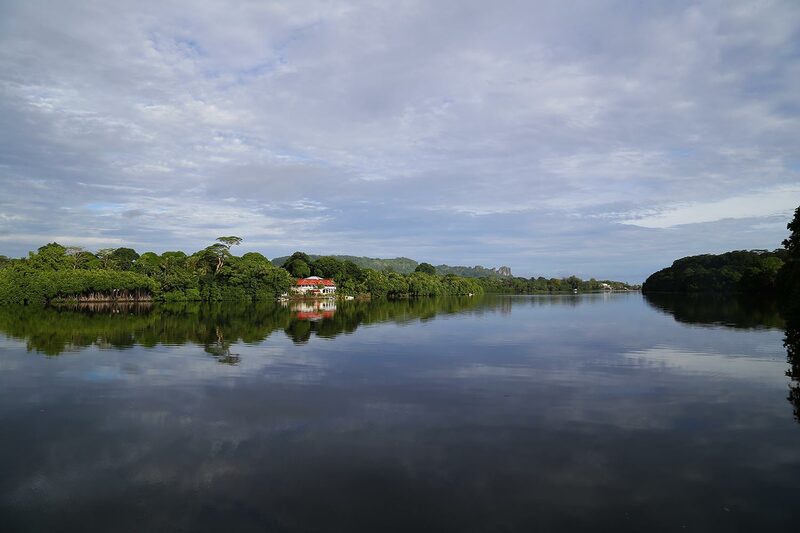 Pohnpei is the largest of the states, each of which has its own language and distinct culture. I searched the Internet and amassed enough information to scare me. “Pohnpei is the wettest place on Earth,” one site proclaimed. I bought anti-fungal cream. “Pohnpei is home to a large variety of insects and mosquitoes,” touted another. I bought insecticide with DEET and a brimmed hat with attached netting that flowed to my chin. “One of the most beautiful and remote places in the world,” extolled an online FSM authority. Remote? I refreshed my CPR, packed Red Cross first-aid books and worried. What if I suddenly need a bypass? What if David has a stroke? What if we both start to choke? I packed Benadryl and an Epi-pen, and every antibiotic prescribed to either of us since 1992. I called the Centers for Disease Control and Prevention in Atlanta, they said shots were not necessary, but just to be on the safe side I found a physician willing to give us Hepatitis A inoculations. Each website I found declared Pohnpei a land of streams, mountains, waterfalls, coral reefs, mangrove forests, lagoons and abundant marine life. I was not enticed. Frankly, I think nature is overrated. When I visit our children in the suburbs I miss the reassuring sounds of car alarms and honking taxis. David took care of the travel arrangements, so it wasn’t until we had flown from JFK to the Honolulu airport that I realized we had 2,700 more miles to travel. We flew from Honolulu to Guam, stopping at Johnston Island, Majuro in the Marshall Islands, Kwajalein Atoll in the Marshall Islands, Kosrae and then Pohnpei. It is a 12-hour trip from Hawaii, but I couldn’t keep track of the day, no less the time, because although Kwajalein is west of the 180th meridian it uses time east of the International Date Line. We left Honolulu on Tuesday, got to Majuro on Wednesday, arrived on Kwajalein back on Tuesday and finally were on Pohnpei on Wednesday… I think. We staggered off the plane, retrieved our luggage from the mound of suitcases dumped onto a shelf—no carousels here—and immediately spotted a sign with our names. Our contact person, the chief business officer of the Community College of Micronesia, turns out to be Bob Epstein, formerly of New Jersey. He is one of about 500 expatriates living in Pohnpei. Some of the expats, like Bob, came to escape the corporate culture. Others were Peace Corps volunteers, missionaries or student teachers. Each fell in love with the Island—often with an Island person, too—and never left. Bob placed traditional flowered wreaths of welcome on our heads and escorted us to the South Park Hotel on Pohnrakied Street in Kolonia, the capital of Pohnpei and the only area that has some paved streets. South Park Hotel is one of several accommodations built since new infrastructure on the island allowed good drinking water, dependable electricity, telephone service and an Internet provider to operate. Yoshihko Onozlawa owns South Park Hotel. There is a strong Japanese influence here; after Spain raised her flag over Pohnpei in 1886 and Germany purchased the islands in 1899, Japan won Micronesia in 1914 and ruled it until the end of the Second World War. The elderly residents of the Island can speak Japanese; it was the language they learned in school. After Japan surrendered in 1945, Micronesia became a United States protectorate, part of the Trust Territory of the Pacific Islands. In 1979 the FSM was formed, with the Trusteeship dissolving in 1990 and self-government beginning, along with the Compact of Free Association with the United States. In 1991, Pohnpei became a member of the United Nations. There is glorious sunshine here every day. The island temperature is consistently 80 degrees, it is somewhat muggy, and there is a brief rain shower at least once a day. Kolonia gets about 200 inches of rain a year, the interior land in Pohnpei gets double that, and we soon learn to do what the islanders do, which is to simply ignore the rain. No one uses umbrellas here; in fact, they welcome a drenching as a cooling-down device. We are pleased that our room has an air conditioner and a small refrigerator and colour television. TV programming is one week behind the States but certainly adequate. The draperies and bedspreads are neat and clean, and remind me of a fabric called fiberglass. But never mind the room—our view is breathtaking. Even I am impressed. Serene blue water surrounded not by a sandy beach, but rather a lush green rainforest, and tumbling waterfalls nestled into the steep mountains. We hastily unpack while Bob arranges for our rental car—a Nissan Sentra with 8,000 miles—and then tells us where to appear for tonight’s dinner. Equipped with my downloaded “Places to see in Kolonia” map and Bob’s warning to drive only on paved roads, David and I head for the car. We open the trunk and find a machete! Later we learn that a machete in Pohnpei is as commonplace as hedge clippers back home. There’s always some underbrush in the way or some trees needing a whack. We drive a few minutes to get to Main Street. Along the way we pass children who wave to us and adults who give us the island’s warm greeting—a smile and raised eyebrows. Dogs and cats are roaming about, and neatly dressed children are walking and skipping with each other. The women we pass wear flowery muumuu dresses or colorful flowing skirts with Nike or other American-logo T-shirts. The men are in similar tees, shorts and the footwear that is universal here—those flimsy flip-flops that cost 69 cents in the schlock stores on Broadway but four dollars here in Pohnpei. These kids climb and play and walk miles wearing their flip-flops. So much for my insisting that my children always wear shoes with support when they went out to play for fear that otherwise their ankles would cave and their arches fall—these kids are strong and straight and their feet are just fine. Babies are all around. They are alert, yet content to watch the world from their mothers’ sturdy shoulders. We hear no crying, just sweet cooing sounds and quiet talk between the peaceful babes firmly attached to their moms and the gentle adults walking beside them. The women have long, silky, coal-black hair, shining and groomed into fancy styles. The children, too, are extraordinarily clean and bright, their clothing immaculate. The women regularly meet down by the stream where they wash clothes and dishes. We can hear their chatter and their laughter as they work. We never hear them reprimand their children who jump from rock to rock, climb a bit and play in the water. No warnings of “Don’t fall,” “Watch out” or “Be careful.” The children seem confident and quietly determined. We are told there are no unwanted children here; the extended family is honoured to welcome another child into the clan. We park on Main Street, aptly named just a few years ago when street signs came to Pohnpei. Main Street is the commercial strip with dry-good stores, grocery stores (featuring mainly canned goods from the U.S. with expiration dates of many months ago), a video store (B movies only), a fabric shop and a couple of bars, restaurants and gas stations. U.S. dollars are the currency and food prices seem to be at least double what they are back there. All the shopkeepers speak English and most accept credit cards. Many of the small stores have shelves devoted to local handicrafts and products. Coconut trees are plentiful in Pohnpei so coconut soap and coconut shampoo are popular here. Pepper, from the 100-acre commercial pepper farm, is sold here, too. Also on Main Street: the Bank of Hawaii, the Bank of Guam and the Bank of the FSM. We encounter folks who are friendly and patient, quietly reasoning with small children, calmly waiting for a salesperson. With few exceptions, drivers are unruffled in the occasionally congested Main Street traffic which does not yet have a traffic light. The exceptions? Taxi drivers. Our walking tour is complete when we run out of paved roads. On the way back to the car, we startle when we see, standing right next to the post office, a huge, rusting Japanese battle tank covered by dense jungle flora. We’re told it’s been there for more than half a century. Back in the car, we head for the interior of the island and notice that pigs are wandering around. We learn that a pig is a sign of wealth. Families show their status by donating pigs—the fatter the better—to ritual feasts at weddings and funerals. Roads are carved within the rainforest and lead to family dwellings, which are wooden floors raised on poles cut from coconut, mangrove or breadfruit trees. Most have no walls, but some have tin sides. A typical home, here in the interior, has a thatched roof, a dirt floor and furnishings consisting of benches, tables, some drawers or suitcases which hold clothing, mattresses or platforms for sleeping, and a refrigerator and colour TV. Cooking is done outside. Life in these villages seems to center around the tender care of the children. The more interior we travel, the less clothing is worn. Now we drive to meet David’s colleagues at The Village restaurant. The Village has an adjoining hotel, reputed to be the most luxurious on the island—though it closed in May 2013. We were advised to stay there but I demurred when I learned there were no walls, hence no air conditioning, although the owners graciously provide mosquito netting which hangs from the ceiling and is tucked under the bed frame. Charming, I am sure; but I prefer the last-century Motel 6 atmosphere at our place. The restaurant is cut into the side of a mountain, overlooking a lagoon with a thatched roof and fantastic views. The waitress does not recite daily specials, and we know the food is cooked to order because our party is served one at a time, with 10- to 15-minute intervals between each platter’s presentation. Food is not considered architecture here—a refreshing diversion from Manhattan’s stylized platters drizzled with designs. The menu is heavy on tuna. Pohnpei has the world’s most productive tuna-fishing area, both surface and deep water. Our dinner companions come from other states within the FSM and from Guam and Hawaii. For me, the best part of this dinner experience is eating with impunity—no calorie-counters in this culture. Returning to South Park Hotel we are wearied and immediately drop into a heavy sleep. And then the thumping sounds begin. Thump, thump… pause, then thump again. The rhythmic thumping gets me out of bed and out on to our balcony. The vibrating noise is coming from deep within the forest. The sound persists for hours. I wake David. We try to stay calm. Our nighttime noises are explained at breakfast the next morning, when our hosts tell us about sakau. Each municipality in Pohnpei has two traditional chieftains, each with 12 positions of rank beneath him. Rituals are strictly observed at celebrations, funerals and feasts, and sakau drinking is an important part of each ceremony. Sakau is made from the Indian pepper plant. Like the pig, the sakau plant is a sign of wealth in Pohnpei. The most prosperous families never use up all their sakau plants, allowing them to grow taller and taller—an impressive sign of abundance, not unlike watching a stock portfolio grow. Ritualistically, the roots of the plant are pounded on a flat stone which can be as large as six feet in diameter. The pounding sound, considered sacred when done in a particular rhythm, is made louder by raising the stone onto a ledge. After the root is pounded for hours throughout the night, it is mixed with water and the pulp squeezed through hibiscus bark. The resultant drink is a narcotic, ceremonially served in a half coconut shell. Guests are served in rank order and prohibited from looking at the sacred drink, so they sip with closed eyes. And then, in rank order, their lips and tongues go numb, their legs get heavy, and finally they succumb to sleep. 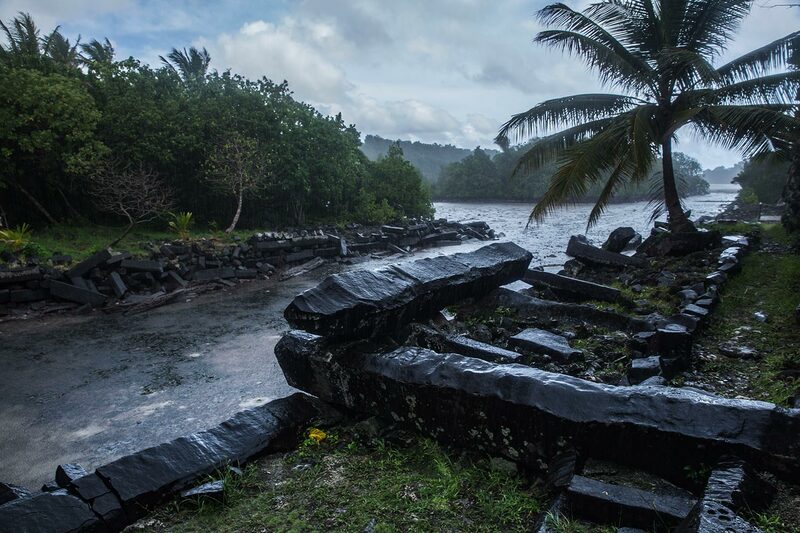 Today’s activity is a trip to Nan Madol, the ruins of an ancient, mysterious, man-made village in southeast Pohnpei. It consists of 92 islets spanning 200 acres, and it is considered so sacred a place that many Pohnpeins will dare not visit. Others might not visit because it is a complicated trip. We must drive miles on unpaved, muddy roads, then get on a very small motor boat, and finally disembark and walk through thigh-high waters. During the boat portion of our journey the skies open and we endure 15 minutes of heavy rain. We climb over and through large, black, slippery rocks to arrive at an awesome structure. The main area of Nan Madol is a majestic stone fortress built on a coral reef. It is made of immense, basalt stones that are six-sided and look like steel logs. We see a high-walled rectangular chamber, and tunnels, burial vaults, stairs and passageways erected from these curious log/rocks. We are five visitors and one guide, and our guide assures us we are reacting like all other visitors as we stand in speechless wonder gazing at the enormous and strangely beautiful structures. The ocean all around is silent, the sun is bright, the sky is clear, and I know I am in the presence of greatness, of spirituality, of power. The atmosphere feels holy; predictably I feel scared. 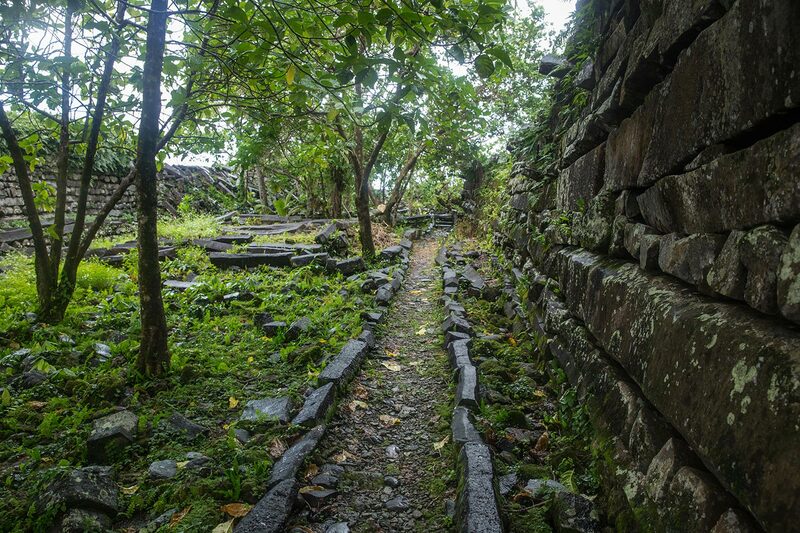 Archeological investigations, including excavations, surveys and radiocarbon-dating by the Smithsonian in 1963, suggest that the process of building Nan Madol took hundreds of years, perhaps nearing completion in 1285 AD. It is presumed that this was once a political and religious centre that housed a royal civilization. In 1986 Nan Madol was placed on the United States National Register of Historic Places. But the mystery remains: these are massive stone slabs, each weighing many, many tons. Where did they come from? How did they get here? We are exhausted from our water trip and happy to arrive back at our motel. I am soon in a deep sleep, but quickly awakened by more strange noises. Not a thumping this time—this is more like a microwave oven signaling the popcorn is done, or perhaps a truck driving in reverse. It is a loud crackling screech in a repetitive rhythm—several beeps, pause, beep. I am wide awake. Now David awakens, too, and we wonder what ritual this may be. In the morning, we learn about geckos. They are nocturnal lizards, about four inches long. They emit loud rhythmic sounds all night long. One lives in our closet. David is lecturing at the college today and I have received permission to sit in on some classes. The College of Micronesia was established in 1970. Today it is fully accredited, extends over a 73-acre campus, and it is educating the next generation of FSM leaders. On the way to class I pass a math professor playing Solitaire on his computer, and I observe students wandering in and out of offices politely asking questions or seeking advice. The students reflect their culture; they are quiet and they are patient. Calmness prevails. In the Psychology 101 classroom students are focused on the teacher. No one fidgets, no ADD here; these students are respectful listeners. Class participation is not a cultural value at the College of Micronesia; they abhor self-promotion. Social harmony and group loyalty are paramount. Kindness counts. I was unable to discern if everyone understood the concepts presented because speaking out, particularly to question the teacher, is simply not done. They are using the same text I used some years ago when I taught this course at Kingsborough Community College in Brooklyn. My brightest students graduated and transferred to Brooklyn College; these students go on to University of Hawaii. David beckons me to meet him after his last day of lecturing. Employees from various offices at the college, following the local custom honoring a guest speaker, have each contributed a dish for lunch. I join the group in eating fried dumplings, Philippine meat pie, pineapple upside down cake and fried breadfruit. Waiting on the long food line I lose my New York attitude and try to emulate the dignified and respectful mien of those around me. No food fights or line-cutting, here. Unfortunately, I cannot thank anyone for the delicious food they prepared because Micronesians consider it bad form to openly seek recognition, thus they will not brag about their recipe or even acknowledge which dish is their contribution. A well-dressed professional woman introduces herself as Doreena, an accountant, and asks if I have any questions about Pohnpei. When I mention that I have heard there is a sub-community of people who do wood carvings for a living she explains that she is part of that tribe, the Kapingamarangi village. They are known as the “shark carvers” and they come from a small atoll south of Pohnpei. Their village occupies a discreet area and houses about 500 residents. Doreena volunteers to meet us later in the evening for a tour of her village. She picks us up at our hotel in her Jeep and escorts us through the muddy roads to the interior region where we see family homes without walls, filled with children, teens and adults. They are all busy. In one home a man is reading Plato, in another a young woman is studying a book of math formulas. There are several groups of men playing cards. We continue to peek and see some folks watching television, others reading, but in most homes young and old are sitting around tables chatting while carefully using carving implements. Focused concentration is the common trait in Pohnpei. The houses in this village adjoin one another, and there is a central outhouse for every few families. Clothing is kept in valises; there are scant chests of drawers. Clotheslines, full of brightly colored dresses and shirts, are everywhere. Raised wooden platforms are used as sleeping areas. Doreena explains that teens leave the atoll when they are ready for high school to take advantage of the fine education offered in central Pohnpei. Children are raised communally and I observe toddlers being cuddled and kissed, and infants and babies lovingly held by family members of all ages. Inside their homes, boys and men take active roles in childcare, but outside that work falls to the girls and women. We buy some carved wooden items—a shark, an intricately carved outrigger and a cute frog. The next morning, we head for the airport with our luggage, including the cumbersome suitcase filled with our untouched antibiotics, gauze pads, ointments and more. Planes come in and out only once a day, three days a week. Travellers politely wait for the plane—no shoving, no pushing, no shouting, just the usual quiet determination that works so well for the residents of Pohnpei. There are plenty of small children at the airport—some are seeing off a relative, others are waiting for the arrival of a family member. Yet we hear no whining, no shouting, no pleading for change for the vending machine. As we head for the tarmac I take a last look at the bright, sun-soaked landscape, the lush green mountainsides, the cerulean sky, and for a moment—just a fleeting moment, of course—I understand the Bob Epsteins of the world. Children wave to us when we board and I, the jaded New Yorker, wave right back. Corrections: The original version of this story incorrectly stated the car ride from South Park Hotel to the main road took 10 minutes, when it is in fact closer to three. It also did not clarify that Village Hotel closed in 2013. These facts have been corrected and Outpost regrets the errors. When Roberta Temes is not forced to travel, she is in her New Jersey office treating her psychotherapy clients or editing works by her memoir clients. Visit www.drroberta.com and www.memoirclassonline.com for more info. No mention has been made to the introduction of Peeper and spice crops to Ponape and the other islands. ?